Whether you are a business owner, esthetician, wax specialist, or really anything- maintaining healthy skin is VITAL to your business. Why? If a client is not educated they are most likely going to blame the technician. For example, a client gets her first bikini wax and is not told to exfoliate, or about any post-wax care. This client is likely to be dissatisfied with the service, get ingrown hairs, and blame the waxer. Yes, educating your clients will, in turn, boost your retail business, but that is not the ultimate goal here. It is helping with skincare, and adding long-term, repeat clients to your business. A woman's health states "As we age, the process of cell regeneration slows down. This means that the body is slower to shed skin cells and generate new ones. When old skin cells start to pile up on the surface of the skin, it can leave skin looking dull, rough, and dry. Furthermore, the build-up of dead skin cells can result in excess oil and clogged pores, leading to blemishes and acne." Proper exfoliation removes the barrier of dead skin cells clogging the skin and uncovers fresh new cells below. This opens the way for moisturizing products to penetrate more deeply into the skin, which makes them more effective. In short, a regular exfoliating routine will leave your skin looking fresh and healthy." 'Tis the season for dry skin, make sure you have your bases covered. Try these mega packs to offer your clients retail to help them stay smooth and exfoliated! This is a natural bristle contour body brush made with boar hair. It has been ergonomically designed for superior massage leverage while bathing. Use it to exfoliate the skin and stimulate circulation. Massage done with Sisal fibers have calming effects for sensitive skin that is prone to eczema and acne. Cleanses, peels and refreshes skin. Detachable wood handle. Get a handle on this far-reaching body brush. Regular scrubbing is important because it unclogs pores allowing the skin to release toxins trapped inside the body. A plush matting of natural bristles gently exfoliates and stirs up circulation, while the deluxe long-reach handle gives you a helping hand to get at those hard-to-reach places. Note: Handle is detachable and brush head has a strap. 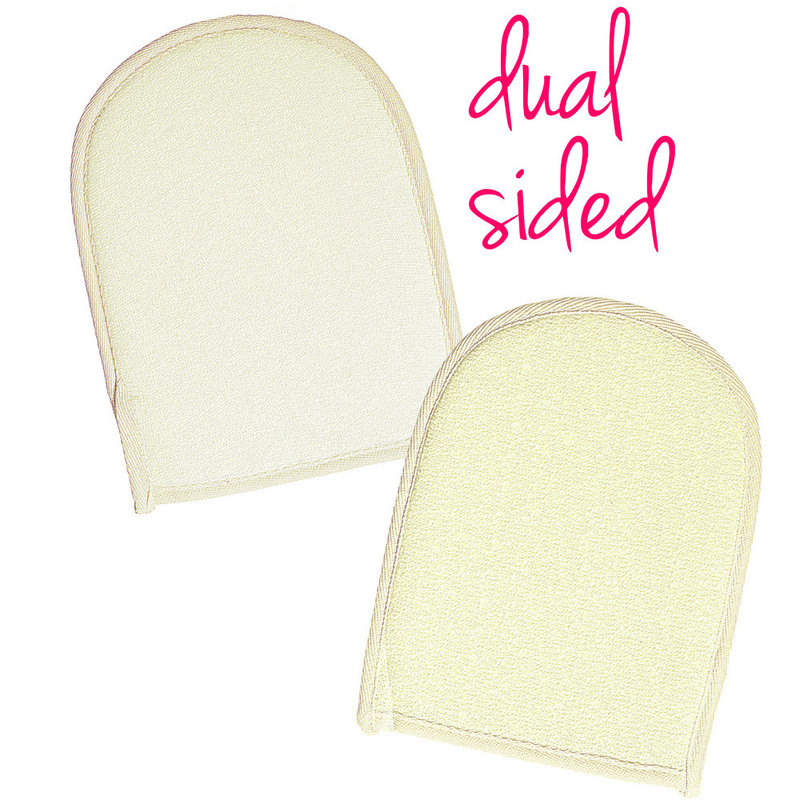 Use this gentle exfoliating bath mitt to cleanse and renew skin with ease. Hang to dry using the conveniently attached loop. This item makes an excellent gift with purchase. Each exfoliating bath mitt is individually wrapped in a poly bag with retail hang tab making it perfect for resale. For more exfoliation products click here! After reading Amy Sciarretto's blog about The 6 Emotional Stages Of Getting a Brazilian Wax, I got to thinking - what can my clients do to help ease this emotional roller coaster their clients may experience prior to their waxing services? Obviously, for estheticians everywhere, regular, repeat clients are their bread and butter. These are the clients they can count on seeing on a regular basis, whether it be for facials, massage, or a myriad of other services. Do any of those other services create quite the same outpouring of emotions similar to waxing? I doubt it, which is why I want to talk about the uncomfortable! #1. Akin Cleanliness to Godliness. I'm going to start with this one, because it is a biggie - and one that I am afraid some people might take for granted. I remember the first Brazilian Wax I ever received. I was already working for Pure Spa Direct, and had pretty much the rest of my body waxed at some point or another. I finally took the plunge to get a Brazilian, and boy oh boy was I nervous. Early on in the service, my waxer dropped a wax applicator on the floor. She made a big deal of pointing it out to me, pointing out that she was pushing it out of the way with her foot, and that it would stay right there on the floor until my service was over. At the time, I thought her reaction was overkill. However, reflecting back on it, I realized that I have never worried about that location double-dipping or using a dirty wax applicator on my nether regions. My point here is use the most sanitary practices possible, and take the time to point out all of the steps you are taking to ensure your client's experience is a clean and sanitary one. They may not consciously realize it, but you will be instilling a whole lot of trust with your actions. #2. Choose high quality wax for superior results, with less irritation. Coming from personal experience, there is a huge difference in the quality of waxes on the market today. Pure Spa Direct offers a wide variety of waxes in a range of quality and price points, but we have had the best results with our high-end waxes. Switching to a high-quality wax does not necessarily mean taking a cut on your profits, either. One of the most popular high-end wax lines we offer, Mancine Professional, is priced at a similar price point as our mid-range waxes! #3. Use high quality pre- and post-wax products. If you are diving into a Brazilian wax without prepping the skin, your clients' emotions are going to be roller coastering all over the place! Some high-end waxes recommend prepping the skin with a pre-wax oil, in order to reduce traction on the skin, and allow the wax to better adhere to the hair only. Your after-wax methods are key here too - make sure all straggling wax goo has been removed, and applying an ingrown hair treatment makes your clients feel like their well-being is important to you. Plus, applying an ingrown hair treatment during your wax makes for a great transition into selling retail ingrown hair products for your clients to use at home! I know, I know, it almost seems counterproductive for me to suggest you cross-sell your clients on retail products to keep their emotions in check. But think about the items you can retail them - and the effect they will have on their emotions. To start, every good waxer should be offering their clients some sort of numbing cream. If they are regulars and come back every 4/6/8 weeks as recommended, they will learn to appreciate and love this product. Our favorite is the No Scream Cream, but there are a number of others available as well. The simple act of applying a numbing cream 30 or so minutes prior to their appointment is going to help calm your clients nerves. They will feel more in control of their pain levels, and will remember that you had them in mind when you recommended the product. #5. Offer knowledge before, during, and after the service. Remember, YOU are the expert - but you don't have to keep all that hairy knowledge to yourself! Explain the hair growth cycle to your clients, and let them know why you want them on the schedule you are recommending. Explain the effects of waxing, as well as the best (and worst) times to wax. Encourage questions. The more information you provide, the more comfortable your client will feel baring all to you. #6. Keep notes about each service. While it is somewhat uncomfortable to be making small talk while digging in clients' private parts, the client will likely feel more at ease when there is easy banter going on. After each session, jot down some of the things your client might have mentioned, and review these notes prior to their next appointment. This small act will go a long way in building trust and a lasting relationship with your clients. If they mention parties, birthdays, events, etc., and you ask them about it during the next service, they will be blown away! Aside from small talk notes, keep notes about anything out of the ordinary that happens in the service, so you can keep an eye out for a pattern. For example, if you notice a client repeatedly develops ingrown hairs in one location, make sure to may special attention to that area, and offer your client advice to avoid developing them in the future. #7. Have an excellent system in place for scheduling follow up appointments. Remember, the goal here is to build a lasting, repeat relationship with your client. Regularly scheduled waxing appointments will help maintain your business, and keep your clients happy. Always urge clients to set their next appointment before leaving, and be sure to follow up with them by phone, email, or text message a day or two prior to their service. Keep track of when they purchase each retail item and roughly how long each should last. Include information about purchasing new retail products at appropriate times. By not bombarding the client with re-purchase information each time, they will appreciate and listen to you when you do recommend stocking up.